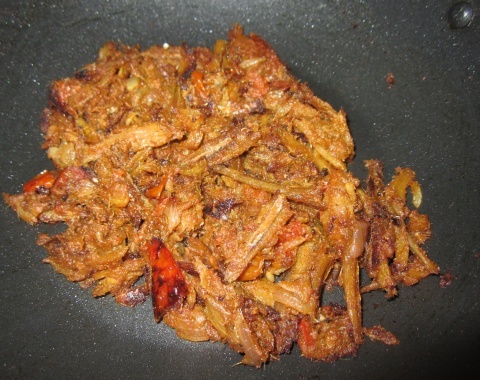 Nethili (Anchovies) is one of the tasty variety which everybody likes. You can also try this recipe with Vaalai karuvadu(Ribbon) and Eral karuvadu(Prawn). Soak the dry fish in water for 1 hour. Remove the head and intestine part. Wash it in running tap water. Now Heat oil in a pan or kadhai. Add mustard seeds and curry leaves. Add chopped onions and ginger-garlic paste. Cook it till nice aroma comes. Add tomatoes and fry it for a minute. Add turmeric powder, red chilli powder, coriander powder and garam masala. Mix well and add dry fish. Add salt to taste. Add less salt since sometimes the dry fish will have more salt content present which will make your dish more salty. Cook the mixture covered for 15mins without adding water. Check it frequently because it may get deep fried. Garnish with Coriander leaves and serve it hot with rasam rice. I have dry anchovies but did not know what to do with it. Thanks for the recipe.